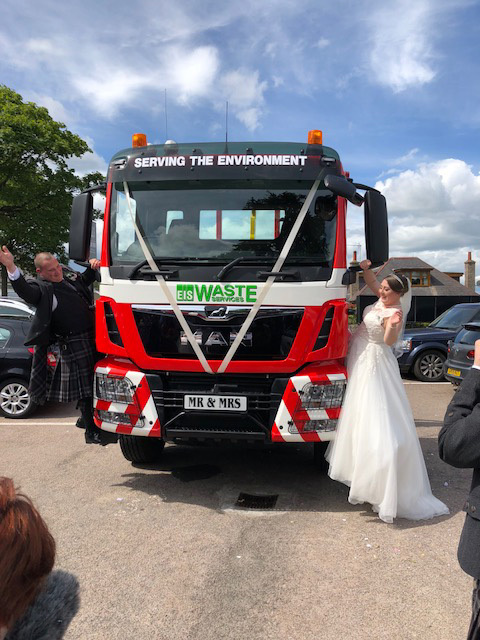 EIS waste Services Ltd sprung a surprise on driver Michael Pirie on Friday 15th June by arriving at his wedding in our Brand New MAN 32t RORO. Michael`s Brother and Best Man Steve had thought of the idea as a surprise and discussed it with Transport Manager Raymond Henderson who was only to happy to follow the idea through. With the help of MAN Truck and Bus Uk Salesman Craig Easton the lorry was prepared and then taken to the Palm Court Hotel in Aberdeen for the big surprise and the look on Michaels and his new wife Stacey`s face when the truck arrived Air Horns blaring into the car park showed they both had no clue of the plan. Transport Manager Raymond Henderson then handed over the Mr & Mrs number plate to the happy couple before leaving them to get on with their special day. All at EIS Waste Services Ltd wish Michael and Stacey a long and happy marriage together.